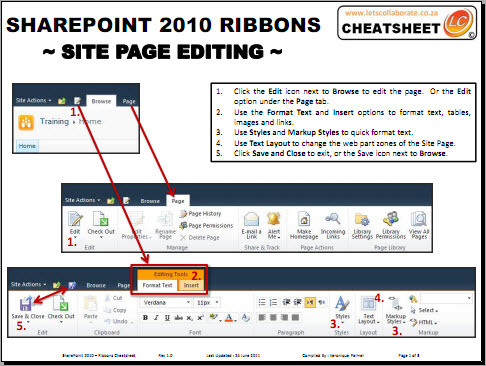 Download a 3 page set of the ribbons used to manage Site Pages, Lists and Libraries. It’s stored on Lets Collaborate, under the Resource Centre, Documents by Lets Collaborate. My pleasure Anne, so glad they helped! That’s quite the jump you’re making, well done on being so positive about the changes – it sounds like you’re keen to do it! Keep it up and shout if I can be of any help. At last what so many of us need. We are upgrading SP2003 to SP2010 without prior training. The biggest problem I and my cohort (yes there are at least 20 of us 🙂 have is unfamiliarity with the ribbon. Once we can find the right “button” or section, most of us have no problem from that point on.